LAFAYETTE — Two brothers, born and raised in Lafayette, found opportunities and quickly rose through the ranks, thanks to a company that took a chance on them. The same company is looking to take a chance on you. Troy and Garrett Wilson share a bond. It's a special connection. The twins call each other best friends. They also share a struggle. Garrett said the two have gone through a major struggle throughout their lives, living with cerebral palsy. Garrett says it's nice to have someone to whom he can relate. 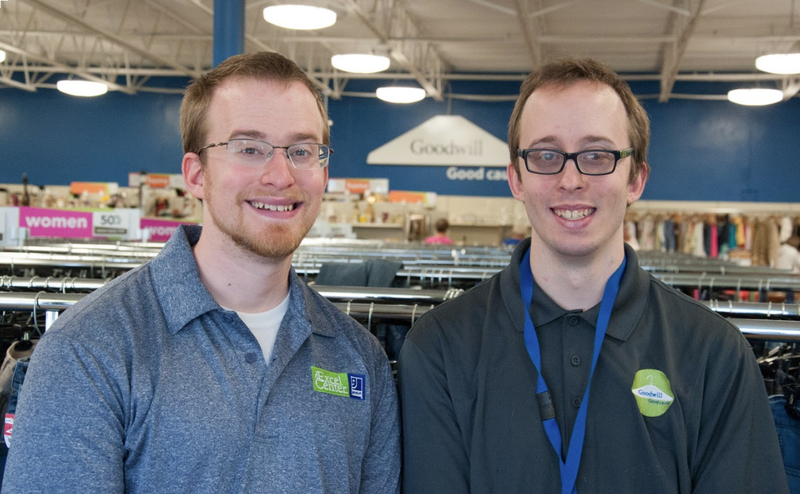 Despite their battle with cerebral palsy, Troy and Garrett are flourishing in their respective departments for Goodwill Industries. Troy, whose condition affects the left side of his body, started with Goodwill as a volunteer. Six months later, he was hired as an associate. Things moved fast from there. "It took me about a little over a year to get to the point where I am now, which is a team leader," Troy said. Now, he manages roughly 35 workers and oversees store operations. For Troy, Goodwill's mission and this experience are a perfect fit. "We try to focus on the strengths of an individual, while trying to harness the weaknesses and make those into strengths," Troy said. Garrett caught the teaching bug after college. He volunteered with Americorp in Chicago schools. Eventually, a friend led him to Goodwill's educational programs in Indiana. It wasn't long before Garrett was promoted to Lead Teacher for Goodwill's Lafayette Excel Center — a tuition-free high school for adults looking for that second chance to earn a diploma. "We really seek to empower those who are weak in society to give them an opportunity like ourselves, even if they have a disability," Garrett said. The brothers' stories are a testament to what Goodwill management claims the company tries to do for all of its more than 4,000 employees in southern and central Indiana. As a company, Goodwill prides itself on opening up a chance. "I really want people to understand that if you've heard 'no' from other people, you've heard 'no' because you don't have a high school diploma, you've heard 'no' because you have a disability, you've heard 'no' because you don't have a strong work history, or you have a criminal history, you're not going to hear 'no' at goodwill," Cindy Graham, vice president of marketing for Goodwill of Central & Southern Indiana, said. Goodwill of Central & Southern Indiana has up to 400 openings at any given time. Retail work is only part of that. The company is also looking to fill nursing positions for home healthcare nurses, assembly line positions for Goodwill's commercial services division.It also needs janitors and groundskeepers. The company offers competitive wages, flexibility, advancement and benefits. Goodwill has programs helping former convicts with a record get a foothold on a new career path. It helps first-time mothers, senior citizens, those with disabilities, and adults who need a diploma. Troy is living proof it also helps build a resume and build confidence. "The best part of my job, that gives me the most recognition and makes me the proudest, is to see individuals grow underneath my leadership," Troy said.